Posted March 30, 2018 & filed under Sharetec's Web Services. 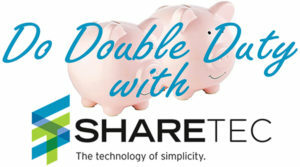 With Sharetec’s Web Member Services feature, your Credit Union can conveniently do double duty. This business tool enables you to offer both members and non-members the means to apply for loans through your Credit Union website. And as non-members apply for their Credit Union membership, they can simultaneously submit a loan application―making the online process twice as nice for applicants and Credit Unions alike. Sharetec’s Online Member Services application allows your existing members to apply for loans, shares, share drafts and even certificates of deposit online with ease. They simply sign into their home banking site and apply for their loan and/or share products of choice. And because non-members can apply for their membership, loans and share accounts concurrently, your staff and your potential members will both save valuable time. Once applications are completed, they are immediately sent to a loan officer or member services representative for review. Since the Sharetec application is online, loan officers and member services representatives will not have to re-key any of the information, which saves more time. With Sharetec’s unique customization capabilities, you can choose the look and feel of your online application page to set it apart from other sites. Your staff can select which products to feature for your applicants’ consideration, as well as how much information will be required through the application process. By taking advantage of the benefits and capabilities of Sharetec’s Apply Online feature, your Credit Union will have the potential to capture a larger share of the loan and the membership market—how’s that for double duty? Contact Lori Tuyo today to learn more!